There has been no shortage of action on the field during the ongoing Test series between Australia and India. Apart from all the cricketing action, we have seen a lot of sledging and banter between the players, especially from the mouth of Australian captain Tim Paine. In fact, he was at it today as well during the second day's play of the third Test, having a hilarious conversation with Rohit Sharma. The exchange between Paine and Rohit was clearly a light-hearted one. However, towards the end of the day, things did turn a little ugly on-field. 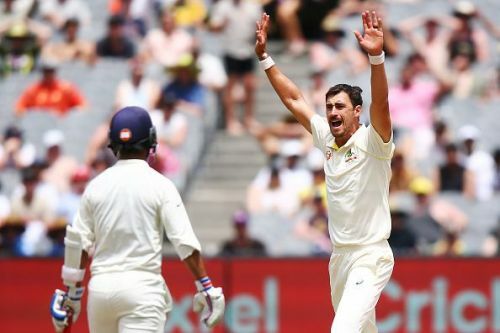 Aussie pacer Mitchell Starc was visibly frustrated with Rishabh Pant as the youngster ran on the "danger area" of the pitch on a few occasions. Starc did not say anything the first time it happened but let his frustration out when Pant did it the second time. He followed that up with a venomous 147.5 kmph bouncer which Pant managed to pull away for a single. Starc finally did manage to get the youngster's wicket in his very next over with another short delivery. However, the damage was done by then as Pant scored 39 valuable runs and put on a 76-run partnership with Rohit Sharma for the sixth wicket. India declared their innings after putting 443 runs on the board for the loss of seven wickets. In reply, the Indian bowling trio of Ishant Sharma, Jasprit Bumrah, and Ravindra Jadeja troubled both Aaron Finch and Marcus Harris but the Aussie duo stood strong and ended the day with 8 runs on the board without losing any wickets.